I am going to GUADEC and it will be a first timer. GNOME Foundation has been kind enough to sponsor me and I’d like to thank them for doing so. It will be an adventure for me for sure! I’ll be volunteering as runner and session chair on at least Sunday, Monday and probably more. I’ll be participating in Engagement’s Birds of a Feather session. I plan to perform a lighting talk around these promotional videos I tinker with. Most importantly I’ll be meeting a lot of people, both new and known. It will be interesting, inspiring and motivating. A nice learning opportunity I’d say. A month ago my group’s semesterproject ended and with extremely positive feedback. At the 2nd semester Medialogy study me and six other students have been working on Social Circle, a question-based game where players can get to know each other and have fun. Particularly interesting was the different topics within media technology I got to work with in relation to Social Circle. Working with the user through a contextual inquiry was insightful and inspired a lot of designs which we kept testing and improving. This project also gave me a hands-on experience with programming the virtual interface in Processing using Eclipse. I really enjoyed working with the interaction design and visuals. Organizing the semesterproject was also less of a hassle for me this time but I plan to continue exploring different tools for this. First semester introduced us to programming using Processing and Eclipse, second semester introduced us to electronics prototyping via Arduino. The prototype we created of the designed solution, is composed of an Arduino controlling six player boards with voting buttons and LEDs which it reads. 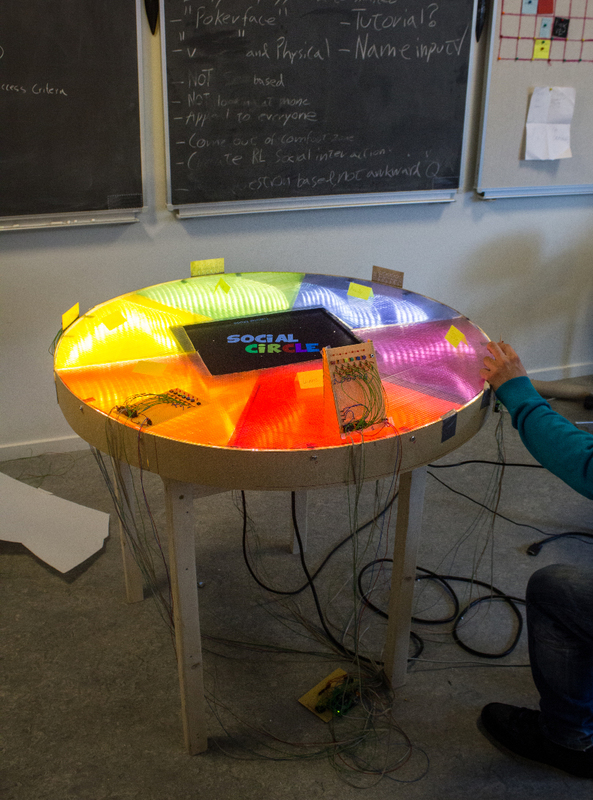 The Arduino is connected to a virtual interface showed on a 19″ screen in the middle of the table. Players receive harmless question such as “Which player would be the best superhero?” and everyone then place a vote on each other using the player boards. Votes are then revealed and points are given to the agreeing majority. If players votes indicate disagreement, a discussion round is started where players have to persuade each other to vote differently. Final prototype used to evaluate the game design’s ability to let players socialize. This semester has stirred my curiosity about designing interaction, which I plan to stimulate by working with the GNOME Design Team. Another long-term goal for me is to learn more about programming graphical user interfaces, particularly using GTK 3 as well as on the web. First I have a promotional video to finish and a GNOME conference to attend to, however. Looking forward to both! Status: All animations finished, first draft rendered and being revised. Today I reached a new milestone. The last animations has been finished and I can now render out a full-fledged video about GNOME’s documentation efforts. 60-70% of the 1:48 minute long video consist of animation (the purple blocks) with a few screencasts here and there (blue blocks) This is because I’ve used this project as a learning opportunity for animating. This also means that the video contains some experiments in terms of style, mixing 2D and 3D, color and silhouettes in various ways. – All scenes are named with a number in front, and all objects & materials of each scene are named with the scenes number. A camera in the “01_intro” scene would be called “01_Camera”. 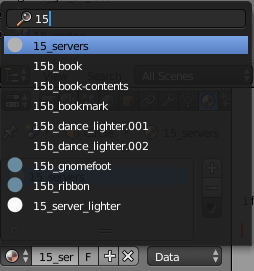 This makes it easy to filter the items in Blender’s dropdown lists (just search for the scene number). 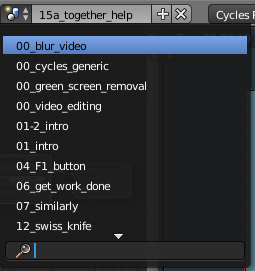 – All scenes are kept in one blender file. All external files are kept in sub-folders next to the blender file with self-explanatory names. – All animations are rendered to PNG and their folder inside “Animation” is called the same as the scene they were rendered from. – All generic tools, templates and master scenes use “00” in front of their name so they always appear in the top. 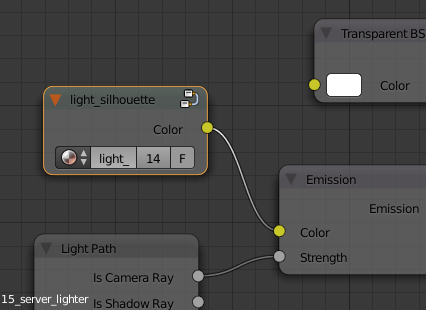 – Common RGB colors and textures can be shared across scenes through node groups if they re-occur. They are then easily changeable and easy to add to any new scene when needed. This means I’m starting the process of revision. I’ll be looking through the video, fix bugs, holes, glitches and send it around for feedback on the timing, sound and animations. Loooking forward to show this project, nice, clean and polished.